We survived the first day of summer vacation without any yelling. Impressive. The second day...not so much. I think everyone was in some sort of relaxed and blissful state with not having school. It was worn off by this morning. Business as usual. Meaning picking on each other, yelling, throwing fits, etc. Is this how the rest of the summer will be? I really hope not. Around lunch time Mattey let out a squeal. Next thing I know she's running away from the microwave. I asked her what was wrong and she said there was a huge bug (I think she said hornet) over there. I saw it and asked for someone to get me a shoe. No one did. (So helpful, aren't they?) While I went to get a shoe the bug moved. I couldn't find it anywhere and I knew it wasn't a hornet. Maybe it's a new mutant bug that can disappear. Even though I said it was gone the reds didn't want to step foot in the kitchen. I found that to be humorous since it could fly and literally be anywhere in the house. After a few minutes Mat decided she'd risk it and get lunch. Kade still wouldn't. A few minutes later I found the huge bug on the floor. It looks like an enormous mosquito but I'm not sure what it is. Can anyone tell me? I shooed it toward the back door with a shoe. I got it close enough that when I opened the door it hopped right out. While doing this I probably let in five other bugs. It could be a long buggy summer if we keep this up. The kids will just have to learn to kill them on their own. 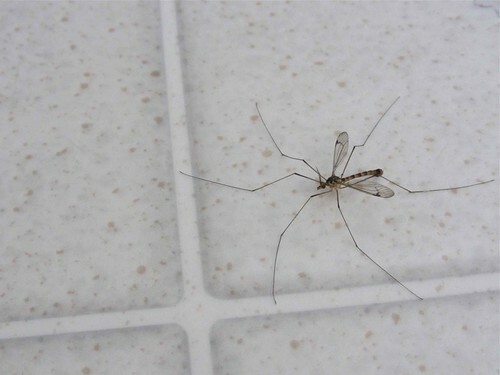 I think it's a Mosquito Hawk (or Crane Fly). We used to get them all the time! They don't bite humans, just scare them!